I have a major soft spot for cranberry-orange flavors. The coffee shop just a few blocks from my apartment in Iowa sold cranberry orange muffins and for about a month one summer, I think I ate one nearly every morning. 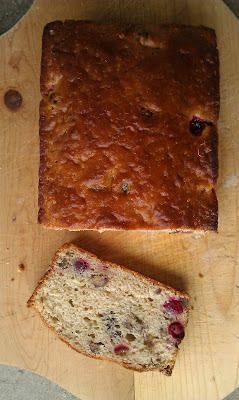 Once, my mother made an amazing cranberry spice cake and cranberry-orange bread that I ate happily even though it didn’t cook all the way through. That’s right. I ate around the unbaked part. So every year when the weather starts to turn cold, the fresh organic cranberries call out to me. 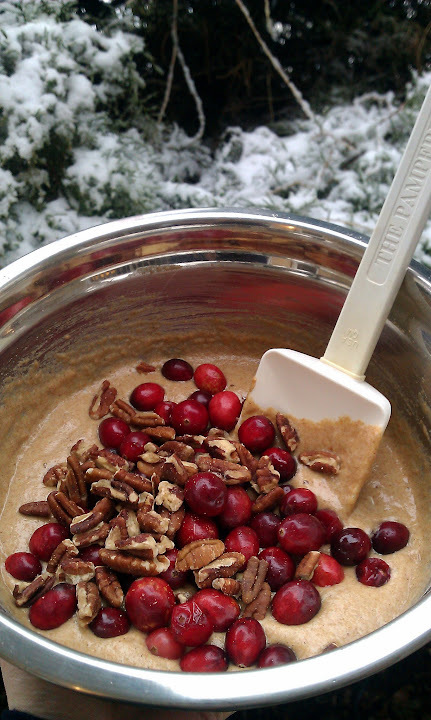 One year, when I decided to add pecans, look what I found. I made a few adjustments to the recipe — I used vanilla soymilk because I was out of orange juice (thereby eliminating the flavor that was the original inspiration, which is probably a good thing because I might have gone into cranberry-orange overload). I also never have buttermilk in the house, so I’ve long-since learned that yogurt is a perfect substitute, as it keeps the tart flavor and the live cultures of the buttermilk needed in the recipe without causing you to buy something you might not use again in its limited window. And because I love pecans, I didn’t chop or toast them, and the big, nutty chunks in the final product are great. Finally, though the recipe (this one and all the others I found) do mention that frozen or dried cranberries would work just as well, I would highly recommend using whole, fresh cranberries if you can. 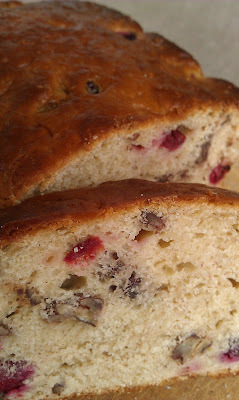 The other options would certainly not change the flavor of the bread, but the fresh cranberries create these wonderfully tart, explosive little juice pockets in the middle of the bread. The perfect wake-up call. This is a bread for winter, a bread to bake while a soft, wet snow falls outside. While you listen to Bon Iver or Massive Attack. 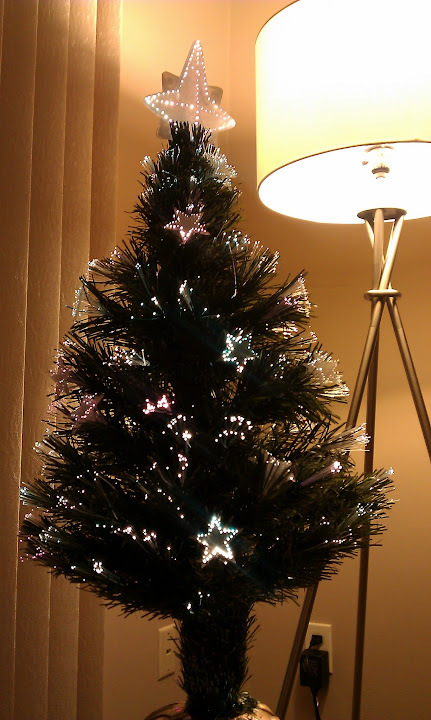 While you put up the Christmas tree — even a small, fake one.